Apparently, Liam Gallagher isn’t just someone who swears a lot on Twitter, has a cult following of ‘lads’ who call him an absolute legend for his ballsy retorts, or someone who is the “voice of reason” when it comes to Brexit. No, no, no. Liam Gallagher used to be in a small band called Oasis with his brother Noel until that all dissolved away in 2009. A couple of years and a fairly mediocre attempt at a band revival in the form of Beady Eye later, and Liam is back with his very first debut album As You Were. With the aid of Greg Kurstin – who can be accredited with songs by the likes of Sia, Adele and Pink – the standard album boasts twelve tracks with gruff vocals and no-nonsense instrumentalism in equal measure. Opening with the glorious single Wall Of Glass, we are built up for an album of some intense ferocity; it’s filled to the brim with call backs to the Britpop heyday as guitars wail from all directions, almost masking Liam’s raspy vocals when the chorus hits. If you’re a fan of this one, Come Back To Me is very similar, heaving with strong guitars and riffs galore. Kurstin’s handy work with lyrics is prevalent from the get-go. Although, Liam penned songs like Greedy Soul, Bold and You Better Run himself – and the terse Greedy Soul especially is an album highlight. While much of the track list is teeming with a brashness and noise, some songs take a step back. For What It’s Worth tows the line in between acceptance and apology, while overflowing with Beatles-esque balladry. Opening lyrics “In my defence, all my intentions were good”, and chorus lyrics “I’ll be the first to say I made my own mistakes” seem reflective and, well, just a bit sad. Paper Crown is, too, quiet and contemplative, with mournful vocals gliding over downbeat percussion. Album closer I’ve All I Need also sticks to the slow lane, but is quite hopeful in its lyricism, and develops throughout to make it a modern interpretation of old school Oasis moodiness when it comes to its closing chords. Whereas if you have the deluxe version, you’ll find that All My People/All Mankind is just moody. And that I Never Wanna Be Like You is just plain weird. When I heard Liam Gallagher was releasing a solo album, I didn’t really know what to think. I liked Oasis, I’ve dipped my toe into Noel Gallagher’s High Flying Birds albums, but after the blunt flop of Beady Eye I didn’t know how As You Were would fair. Turns out, it’s actually pretty good. Whether that’s because it recalls a lot of late Oasis tracks, or it’s kind of impossible not to be compelled by Liam Gallagher and his cultural presence right now it’s hard to say, but yeah, I like it. Liam Gallagher’s third single, from forthcoming debut solo album ‘As You Were’ due for release October 6th, written with Simon Aldred, see’s the Mancunian taking another introspective look at his life so far. Opening line, ‘In my defence all my intentions were good,’ sets the scene for the tracks med-tempo outpouring of significantly calmed emotions. Though never quite a full out apology, ‘Seems that I’ve forgot just what I was fighting for but underneath my skin, there’s a fire within still burning,’ overall the track’s theme feels pretty sincere. Liam’s love it or hate it, though the majority agree, iconic vocal grates mellowly across a fairly remorseful lyric. Instrumentally there is an obvious echo of past sorrowful belter, ‘Don’t Look Back In Anger’. Within this landscape of the past, lines like, the Lennon-esque, ‘The first bird to fly gets all the arrows,’ which may be simply a reference to leaving home, or being the older of this imagined conversation, but with a track that feels this much like a public statement, or closer a declaration of humanity amongst media fuelled madness, it’s hard to avoid hoping it’s in reference to a certain high flying bird. But whoever Liam’s words are directed towards ‘For What It’s Worth’ is well worth attention. Filed Under: Music Tagged With: 2017, Chinatown, Dizzie Rascal, Featured, Japanese Breakfast, Jay-Z, Liam Gallagher, Music Video, Plot Twist, Road Head, Sigrid, The Story of O.J, This weeks music video, Wot U Gonna Do? The latest single from Liam Gallagher’s debut solo album, ‘As You Were’ October the 6th, which is to feature tracks produced by Greg Kurstin (Adele, Beck, The Shins, Kendrick Lamar) and Dan Grech-Marguerat (Radiohead, Cira Waves, Mumford and Sons) might just reveal a softer side to the much loved, and abhorred, Mancunian. ‘Chinatown’ see’s Liam’s, casually iconic, grating vocal wind, almost delicately… almost, around simply plucked acoustic guitar, steady heavy footed rhythm and of course a familiar helping of John Lennon references, present in both the tracks lyrics and a spacious helping of reverb. Compared to first single ‘Wall Of Glass’ things are a little more muted here, not only within the acoustic, rather than shredded, guitar lines but also Liam’s sneering barbs. Though a humorously sharp tongue is still in play within Liam’s second offering: ‘Well the cops are taking over while everyone’s in yoga cause happiness is still a warm gun’ overall ‘Chinatown’ is a more tender track with a gentle melody that plainly states why this particular Gallagher’s ability shouldn’t be underestimated. It is safe to say that in the immediate aftermath of Oasis, Noel had the most immediate success and gave the impression that it was Liam who needed Oasis and needed Noel. The second and subsequently last Beady Eye album from 2013 was by no means a bad effort however and Noel hardly set the world alight with his second solo effort Chasing Yesterday. For his first solo effort, Liam has enlisted the expertise of Greg Kurstin who has worked with everyone from The Shins, Beck, Tegan & Sara, Kendrick Lamar to Adele. Though primarily a producer, Liam has also had Greg in as a co-writer for his new single ‘Wall of Glass’. To my surprise, this track sees Liam shake off the relative obscurity of the last few years and find his quality again. Greg has set Liam in a familiar setting of shredding and ringing guitars, but adds sharpness, bluesy highlights, professional backing vocalists and a driving beat that feeds a keen sense of rhythm in the song. It is punchy and is tailored to Liam’s swagger. Unlike with Beady Eye, these vocals aren’t left in isolation and so sound as rich as they’ve ever done. The lyrics aren’t anything spectacular, but again they are tailored to Liam’s vocal strengths and his attitude on show. There is even a subtle sense of depth with this track with parts falling away and building to a bold fruition. It isn’t going to be track of the year, but it’s a damn good song which for Liam, was removing the shackles of Oasis and doing what most artists do; bringing in proven success. 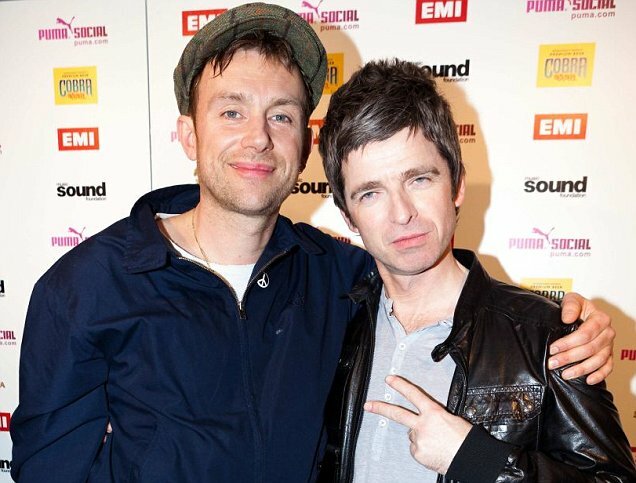 Noel Gallagher and Damon Albarn working together? These two men may not have sparked the life back into British Music in the 90’s. That’s for sure. But they fired it to the top of the charts and took it to new levels and largely shaped the decade. They were also not known for being best chums but perhaps that’s more a description of Liam Gallagher who still holds his distaste today. You can also take into account the role NME played in making it a bigger deal than it was. But it’s no secret that both of them get on very well now. Blur bassist Alex James eluded to this and that they are working together. They’ve already performed together so why not? Just imagine what could be created given their skills. If you want to be fair an analytical about it than both have particular strengths to bring to a collaboration. Damon is probably the more musically capable of the two. Blur have had a variety of sounds that have worked for them and then when you go into the Gorillaz catalogue and then his recent solo work then anything is possible. He is also has an astute understanding of World Music as well as other genres and avenues of music and Damon will probably make it profound, intriguing and make it work. On the other hand Noel is the more capable lyricist. Not only has he wrote the most relatable lyrics of all time but he has made them with an instant sing a long quality and that part of it he’s retained to this day. Every single album he has worked on has got to number one. From Definitely Maybe to High Flying Birds. 1994 – 2011. He churns out hits for fun and would give any song a hook and direction. It almost seems like a combination too good to miss. Maybe it is? Who says it would work? But when you look at it, it probably would work spectacularly well. Anything by the two of them would be soulful, anthemic, catchy, considered, varied, profound and so much more. You’d know it would largely be about the music too. They are already cemented in the history of music in Britain and beyond. They certainly don’t need anymore money then what they have otherwise they’d both be playing to 70/80,000 people every autumn and would be plugging this and promoting that on every TV and Radio show going. But they are happy doing their own thing at the moment and if that means they come together then we’ll all be the better for it.